In 2006 The Open University commissioned me to write a short introduction to philosophy, as a ‘taster’ for its course A211 Philosophy and the Human Situation — a course which I had taught as an Associate Lecturer and managed in my capacity as a course manager. The material was sent to students registered for the course as part of their preparatory material. A211 was later replaced by a new course, but my introduction was repackaged as a stand-alone unit and made freely available on the OU’s OpenLearn site. I republish the text of the unit below. Although it contains some references to Open University study methods and the course for which it was originally written, most of the advice is applicable to anyone planning to study philosophy, whether at university, college, or school, or on their own (though in the latter case I would would advise trying to link up with with other people studying the subject, since discussion is vital to philosophy). You are free to make use of the material as you wish, but please acknowledge my authorship and retain all the other references and acknowledgements. The following material was written by Maria Kasmirli as a short introduction to philosophy for students planning to enrol on the Open University course Philosophy and the human situation (A211). It contains quotations from the first A211 course book, written by Dr Nigel Warburton. Jon: This is very exciting. Alan: Here is a splendid example in everyday life where two very ordinary people are asking each other what are in essence philosophical questions – ‘What do you mean, “yes”?’ – ‘I mean “yes”’ – and where I, as a philosopher, could help them. What are the limits of freedom in a civilized society? Is it wrong to eat meat or to use animals for scientific research? Do we have free will or is our behaviour totally predetermined by our genes? What is the mind and how is it related to the body? Is religious belief reasonable and is there life after death? I’m sure you’ll agree that these are questions that concern us all and that the answers may profoundly affect how we conduct our everyday lives. You’ve probably thought about many of them yourself and may have discussed them with friends or relatives. But what can philosophers contribute here? The questions just mentioned aren’t straightforward ones, after all. They are questions about politics, morality, religion, and about the fundamental nature of reality (these last are called metaphysical questions). And it is not clear that such questions have definite answers. Some people think one thing, others think another. So perhaps philosophy is just a matter of opinion. This is another common perception of the subject. But is it accurate? There is certainly no universal agreement among philosophers about the six questions I listed, but it doesn’t follow that philosophy is just a matter of opinion-swapping. Philosophy offers a certain way of thinking about these questions that is disciplined and rigorous. Philosophers try to construct rational arguments for their views – showing that they follow logically from more basic principles. (Everyone has a right to their opinion, but you have no right to ask others to take an interest in your opinions unless you can back them up with decent arguments.) Philosophers also try to construct arguments against their opponents’ positions – for example, by showing that they conflict with other principles which all parties accept. These processes won’t always lead to universal agreement, but they will move the debate forward, helping us to understand the strengths and weaknesses of the different positions and the relations between them. Of course, philosophers also have to subject their own beliefs to the standards of rational argument, and they will be prepared to change their minds if there are good arguments against their views. This can make philosophy a challenging subject to study, since it may involve questioning beliefs you hold dear. In the end, however, most people find this process useful. By questioning your beliefs and testing them out in a rigorous way, you can identify your prejudices, wishful thoughts, and lazy assumptions, and replace them with coherent, well thought-out views, which you can defend against criticism. Philosophy is a also useful antidote to dogmatism; in doing philosophy, people often come to realize that their views were not as firmly based as they had thought and become more willing to listen to other people’s views. Another way in which philosophy can help is with clarity. Words can be ambiguous and vague, and arguments can become confused if the participants use the same words in different senses or with different things in mind. (When this happens people are said to be talking past each other; they think they are talking about the same thing – perhaps disagreeing about it – but in fact they have different ideas in mind. If they could only get clear about what they mean, they might find that they do not disagree after all.) One thing philosophers aim to do is to clarify the ideas (or concepts) associated with different words, so that confusions can be avoided. Sometimes they will even introduce new words (technical terms, as they are called) in order represent ideas and distinctions for which we have no everyday words. This concern with the clarification of ideas is central to philosophy, and it has applications in many areas. For example, politicians talk about freedom, democracy, and human rights; but what exactly do they have in mind when they use those words? Do different people use these words in different ways? If so, which notions are the appropriate ones to use in each context? Once we start focusing on questions such as this, we find them popping up everywhere. Almost every question we can ask has philosophical questions lurking in the background – questions about how the terms involved are being used and about the appropriateness of using them in this way. Of course, it is this obsession with the meaning of words that Miller and Bennett were satirizing, and it has its limits. Conceptual clarification on its own won’t give us answers to the questions listed above. But it has a very important role to play all the same; it can help us to resolve confusions and avoid misguided disputes, and can highlight distinctions we need to make in order to advance our thinking about a topic. The skills just mentioned – constructing and criticizing rational arguments and clarifying meanings – are ones that course A211 aims to teach. So in studying the course, you will not only be thinking about some fascinating and important questions, but also developing skills that you can apply in other areas of philosophy and in your daily life. You needn’t worry that the course will turn you into a Beyond the Fringe philosopher preoccupied with hair-splitting disputes and out of touch with the real world. On the contrary, it will help you to engage with everyday issues in a more thoughtful and clear-minded way and with a much better understanding of the issues involved. This section will illustrate the points just made and give you a sense of what it will be like to do philosophy. We shall look at some extracts from the first A211 course book, Arguments for Freedom by Nigel Warburton, and see how philosophical skills can help us to think about political freedom. There will also be a few short exercises for you to do. Although we shall look at actual extracts from the course material, you should bear in mind that this topic will be covered in much more detail in the course itself. On the face of it, freedom, or liberty, seems a simple and obviously good thing. How could we not want freedom, and how could it be bad to try to provide more of it for someone? Yet what do we really mean by ‘freedom’? Is there more than one kind of freedom, and, if so, might we sometimes be forced to choose between them? Could people be oppressed in the name of freedom? Consider the following scenario. Country A invades country B in order to free its people from an oppressive ruler and to promote democracy. (Suppose the leaders of country A are quite sincere in this aim.) But the citizens of the country B resist the invaders and fight to restore the old regime. Both sides regard themselves as fighting for the cause of freedom. Who is right? A useful starting point here is with a distinction drawn by the twentieth-century philosopher Isaiah Berlin (1909–97). Berlin argues that there are two basic types of freedom people have in mind when they talk about political freedom; he calls them positive freedom and negative freedom. Let us begin with negative freedom. Here is how Warburton explains the notion in the course book. The freedom of which I speak is opportunity for action, rather than action itself. If, although I enjoy the right to walk through open doors, I prefer not to do so, but to sit still and vegetate, I am not thereby rendered less free. Freedom is the opportunity to act, not action itself. So, if you park your car across my drive, thereby preventing me from getting my car out, you restrict my freedom; and this is true even if I choose to stay in bed listening to my CDs all day, and would have done so even if you hadn’t parked there. Or, if the state prevents me from going on strike by making my actions illegal, even if I don’t have anything to strike about, and even if I don’t ever intend to strike, my freedom is still curtailed. Negative freedom is a matter of the doors open to me, not of whether I happen to choose to go through them. However, not all restrictions on my possible choices are infringements of my negative freedom. Berlin states that only restrictions imposed by other people affect my freedom. Colloquially, we might say that because we are human we aren’t free to jump ten feet in the air or free to understand what an obscure passage in a difficult book by Hegel means. But when discussing political freedom, the sort we are interested in here, these sorts of restrictions on what we can do, aren’t counted as obstacles to freedom, however distressing they may be. Other people limit our freedom by what they do. Limitations on our action brought about by the nature of the universe or the human body aren’t relevant to the discussion of political freedom. Political freedom is a matter of the relations of power which hold between individuals and between individuals and the state. The clearest cases in which freedom is restricted are when someone forces you to do something. You might be forced to join the army, for instance, if you live in a country which has compulsory military service. The law might force you to wear a crash helmet every time you ride your motorcycle. Your partner might force you to stay in rather than go out to the cinema, or to tidy up the kitchen rather than do another hour’s study. Did you understand Warburton’s explanation and the extracts from Berlin that he quotes? Could you explain the notion of negative freedom yourself and apply it in thinking about real-life situations? When studying philosophy, it’s not enough just to read the set material passively, getting a general impression of what it is about. You need to read carefully and critically, thinking about how the ideas and arguments connect up with each other and how they could be applied. For this reason, the A211 course books contain lots of exercises, designed to test your understanding of the material and to get you thinking about it. Here are some exercises on the passage you have just read. Sum up negative freedom (as you understand it from this passage) in a single sentence. If something prevents me from driving my car, does it automatically follow that my negative freedom has been restricted? Here are various things that might prevent me from driving. Which of them involves a limitation on my negative freedom? (a) I am too ill to drive. (b) I have failed my driving test. (c) I cannot get motor insurance. (d) My partner will not let me drive because he or she fears for my safety. (e) My car is broken. (f) I am just too lazy to drive. Suppose that while my teenage daughter is doing her homework I secretly lock the door to her room so that she can’t get out. She doesn’t notice, however, and I later unlock the door before she wants to leave. Have I restricted her negative freedom? No. It would depend upon exactly what prevented me from driving. Only restrictions imposed by other people count as limitations of one’s negative freedom. Only (d) involves a clear limitation of my negative freedom. (a), (e), and (f) do not, since the restrictions are not imposed by other people. Cases (b) and (c) are a bit more complicated. The fact that we are required to obtain a driving licence and motor insurance before we are allowed to drive is a general restriction on our negative freedom. But the fact that I have failed my driving test or been refused insurance does not necessarily amount to a further restriction on top of this. If I failed to pass the test or to get insurance simply because I didn’t meet the required conditions, then it is my fault I didn’t qualify to drive, not anyone else’s. On the other hand, if the driving examiner or insurance companies involved were biased against me, or if someone had intervened to prevent me from meeting the required conditions, then there would have been a further limitation of my negative freedom. Yes. As Warburton explains, negative freedom is a matter of what opportunities are available to a person (metaphorically speaking, what doors are open for them), whether or not they actually take advantage of them. In locking her door, I was denying my daughter the opportunity to leave her room, even though she didn’t at that time want to leave. Let us turn now to the other notion: positive freedom. Read the following extract, in which Warburton explains the notion. Positive freedom is a more difficult notion to grasp than negative. Put simply it is freedom to do something rather than freedom from interference. Negative freedom is simply a matter of the number and kind of options that lie open for you and their relevance for your life; it is a matter of what you aren’t prevented from doing; the doors that lie unlocked. Positive freedom, in contrast, is a matter of what you can actually do. All sorts of doors may be open, giving you a large amount of negative freedom, and yet you might find that there are still obstacles to taking full advantage of your opportunities. Berlin sometimes talks of positive liberty in terms of the question ‘Who is master?’ I want to be in control of my life, but there may, for example, be internal obstacles to my living the way I really want to. Here we might talk of my increasing my freedom (in the positive sense) by overcoming my less rational desires. From this it should be clear that the notion of positive liberty may rely on the belief that the self can be split into a higher and a lower self, and that the higher or rational self s priorities should be encouraged to overcome the lower, less rational self s inclinations: the passing desires that if acted on can so upset a life plan. The higher self has desires for what will make the individual’s life go well; it wishes to pursue worthwhile and noble goals. The lower self is easily led astray, often by irrational appetites. Consequently, advocates of positive liberty argue, we need to be protected against our own lower selves in order to realize the goals of our higher, ‘true’ selves. In many cases this can only be achieved by coercing us to behave in ways which seem to go against our desires; in fact this coercion is necessary to allow us to fulfil our rational higher desires, desires which we may even be unaware of having. On this view, the freedom which is self-mastery, or positive freedom, may only be achievable if our lower selves are constrained in their actions. By preventing me from going out for a drink or from watching television all night you may help me to realize my ‘true’ freedom which is achievable only if I spend a significant portion of my available time studying. This is what I would have wanted had I been truly free. Sum up positive freedom in a single sentence. What are your ‘higher self’ and ‘lower self’? How can the two conflict? Will increasing a person’s negative freedom automatically increase their positive freedom? Could we increase a person’s positive freedom by limiting their negative freedom? Can you give an example? Your higher self is the part of you that wants to pursue worthwhile long-term goals, such as studying for a degree. Your lower self is the part that wants to satisfy short-term desires and appetites, such as the desire to watch TV or go to the pub. The two can come into conflict if our lower selves distract us from pursuing the goals of our higher selves. No. You might be given the opportunity (negative freedom) to pursue a certain worthwhile goal, but lack the self-mastery (positive freedom) required to follow your higher self and take up the opportunity. Arguably we could. If we prevent somebody from following their lower desires, then we may make it easer for them to follow their higher ones and so to achieve positive freedom. An example would be forbidding my daughter to watch TV until she has done her homework. In denying her the opportunity to satisfy her lower desire to watch TV, I am enabling her to focus on her studies and get a good education, which is in her long-term interest. As you will see when you read Warburton’s book, Berlin thinks that both concepts of freedom are important, but he also warns that they can be abused. If negative freedom is not restricted, then the strong will have a licence to exploit the weak. (For example, most people would accept that the state should place restrictions on the terms on which employers can hire people, in order to prevent them from exploiting their workers.) But Berlin thinks there is an even greater risk of abuse with the concept of positive freedom. The danger is that under the guise of helping people to realize their ‘true’ desires, the state may ignore their views and force them to do things that they have no wish at all to do. This happened, Berlin suggests, in both Nazi Germany and Soviet Russia. These states bullied and oppressed their people on the grounds it knew what was best for them. Here are some examples where negative freedom is restricted in the name of positive freedom. Do they involve a misuse of the notion of positive freedom? Give reasons for your answers. A government compels its citizens to save for their retirement, on the grounds that this is in their own long-term interest. A government prevents its citizens from accessing foreign news broadcasts, on the grounds that they will be corrupted by them. A person with strong and highly unusual sexual desires is forced to receive psychiatric treatment in order to help them live a normal life. A homeless person is taken off the streets against her will and put into supported social housing, on the grounds that her quality of life will be better there. There is no space in this taster unit for a detailed discussion of these examples, but I’ll briefly indicate my own views; you may disagree. I think (1) is probably a legitimate application of the concept of positive freedom. Most people want to have a comfortable old age, and in forcing them to save for their retirement, the government is helping them to pursue their own long-term interests. Perhaps, though, there should be an opt-out clause for those who really do not care about their own future welfare? (2) is a misuse. Most people value the opportunity to inform themselves of different viewpoints and make up their own minds, and it is hard to see how their positive freedom would be increased by denying them this opportunity. (In this case, we would suspect that the government was trying to protect itself from criticism.) (3) is complicated. There is certainly a strong case for forcing a person to receive treatment if their desires make them a danger to society (in the case of paedophiles, for example), but could this be justified on the grounds of promoting the person’s own positive freedom? I think it would depend on what the desires were and whether they were seriously interfering with their ability to live a fulfilling life. (4) is the trickiest case. It is arguable that no one living on the streets can pursue their higher desires (for education, for example, or artistic expression) and that by putting them into supported housing we are freeing them to do this. But do we have the right to force people to change their whole lifestyle, even if it is seriously impoverished? Would the state be justified in taking similar measures against travellers and other people who have unorthodox lifestyles? As I said, the ‘answers’ above are my own. Yours may have been very different. If so, compare the reasons I gave with the ones you gave. Which reasons are stronger and why? Attempting to come to a considered decision should help you to gain a deeper understanding of the distinction between the two kinds of freedom and to appreciate its complexity. You might also like to discuss these cases with friends or relatives and see what they think. Keep an eye out for similar cases in the news and see if you can apply Berlin’s distinction to them. This concludes the present section. We haven’t reached any definite conclusions about the limits of political freedom, but we have seen how distinguishing different notions of freedom can help us to frame new questions and to see familiar ones in a new light. (You might like to go back to the earlier example in which country A invades country B. Does Berlin’s distinction apply in this case? Does it help you to think about the issue?) You will have the chance to explore these issues and others in much more detail when you embark on the course itself. Reading. Reading philosophy is a special skill. You can’t read a philosophy book as you would a novel. You will need to approach it carefully and critically, taking much more time than normal. Different people have different strategies here. Some read each chapter or section through once quickly in order to get a general idea of the subject matter, then read it again more slowly, making notes and annotations as they go. Others prefer to begin with a slow reading, making lots of notes, followed by a quicker re-reading to get the big picture. Either way, you will need to keep certain questions in mind as you go. What are the key terms? What arguments and examples are introduced and what are they supposed to show? What conclusions does the author reach? Make a note of any passages you don’t understand, but don’t let them hold you up too long; things will probably fall into place later. Finally, you should read the material through again with a critical eye. Are the arguments and examples good ones? What objections might be raised? How might the author respond to these objections? On A211 the main reading will consist of a series of specially written books, which also include extracts from the work of famous philosophers. There will also be a set of audio CDs which contain short lectures from the course team and guest speakers. Discussing. If you want to be a philosopher, it is no good just reading philosophy; you will need to start doing it – clarifying meanings, drawing distinctions, and evaluating and constructing arguments. And the best way to do this is in debate with fellow students and tutors. (Philosophy has always had a social dimension; the ancient Greek philosophers used to discuss their ideas while strolling in the public buildings of Athens.) Some people find this daunting, and get upset when their views are criticized, but you should look at it as an opportunity to develop your ideas and hone your philosophical skills. By raising objections to your views, other people will help you to improve your arguments and make your position clearer and stronger. And if it is all done in the right spirit (as it usually is), it can be great fun too! On A211 the main opportunity for discussion will come at tutorials, where you will meet your tutor and fellow students from your region. Tutorial groups are small and friendly, and the atmosphere is very supportive. Do try to attend them if you can, and be prepared to speak up and get involved. The value of tutorials stretches well beyond the two hours you spend in the seminar room. After you leave, you will find yourself thinking about what you said, how it was received, how you might have said it better, or even how, on reflection, the thought behind what you said was mistaken. This is all part of learning to become a philosopher. You will also have an opportunity to debate with fellow students online. Writing. Writing is an extension of the discussion process described above. When you sit down to write about a topic you will be doing much the same thing as when you discuss it in a tutorial. You will be interpreting, evaluating, and constructing arguments. But now you will be doing it in a more careful and structured way, setting out arguments systematically and considering objections to them. And, again, when you get feedback from your tutor, you should regard it as an opportunity to develop your skills and improve your arguments. On A211 there are two types of written assessment: seven tutor-marked assignments (TMAs) and a final exam. Each has a different function. TMAs require you to develop a considered response to a question, which may take several days to compose. 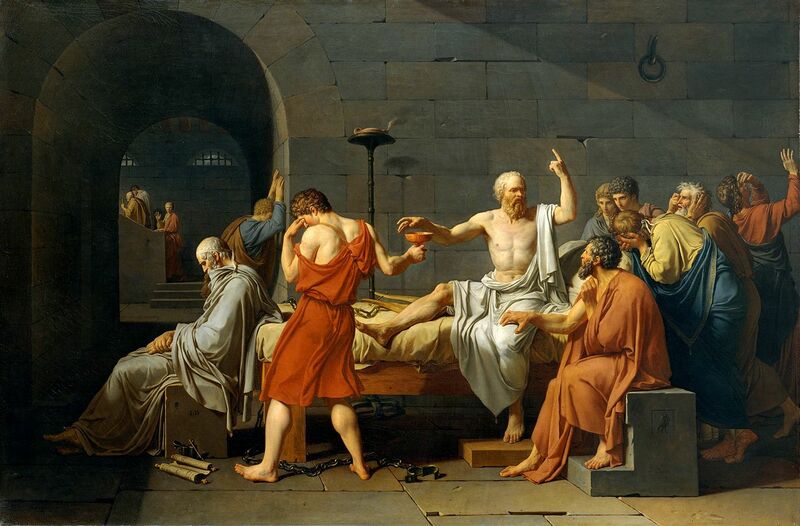 They give you the chance to develop and demonstrate your philosophical skills to best advantage. Exams, on the other hand, require a quicker, more focused response – the sort you might give if you decided to present your thoughts on a topic in the form of a short talk. The ability to produce exam-style responses is an important philosophical skill, and you should prepare for and sit the exam, even if you are not studying the course for credit. I hope this taster pack has given you a sense of what philosophy is like and whetted your appetite for A211. If you would like to do more preparation, I suggest you read Nigel Warburton’s book Philosophy: The Basics (Routledge). Warburton has also compiled a glossary of philosophical terminology, called Thinking from A to Z (also published by Routledge), which is a set book for A211, and which you will need to buy to supplement the course materials. You can find out more about studying philosophy at the Open University by visiting the Department of Philosophy. If you have any queries about the course itself, you can consult the course prospectus at www.open.ac.uk/courses or contact your local OU study centre. I hope you enjoy your studies in philosophy! Warburton, N. (2000) Thinking from A to Z, Routledge (second edition). Except for third party materials and otherwise stated (see terms and conditions), this content is now made available under a Creative Commons Attribution-NonCommercial-ShareAlike 2.0 Licence. Original Copyright © 2006 The Open University.